About twenty minutes from my house, there’s a spring creek that’s very popular with the flyfishing crowd. It flows through a state park, and is loaded with trout. In the river’s heyday, the park’s phone lines were flooded by calls from anglers trying to reserve fishing time. February and March were catch-and-release months. I remember spending nights in my truck, as my breath iced the windshield, so that I would be near the front of the line when the “beats” were handed out; everyone’s goal was to get a choice beat where big and supposedly “sea run” rainbow trout might be caught on a fly. This photo and top: trout food dispenser & sign at the hatchery mentioned in this piece. The only “sea run” that I ever caught there was, at best, ten inches long, but it was indeed bright and silver, signs that it had spent at least part of the winter close to Great South Bay. I’m not sure that the river held any true “sea runs.” It did have a hatchery that pumped out plenty of trout, more than the river could have produced on its own, and some of them did drop down into the tidal section of the stream. If the folks who tossed worms and killifish into the culvert that flowed under Sunrise Highway didn’t get them, a few of those wandering trout returned to the freshwater part of the river, but calling them “sea runs,” in the way a Pacific steelhead is “sea run,” was probably pushing the point. In any event, a few years ago everything changed. Infectious pancreatic necrosis, a disease which often occurs in hatchery situations, was found on the premises, and the state shut the fishery down. Anglers were encouraged to take all of the fish from the stream, to prevent the disease from spreading. The big “sea runs” didn’t run anymore. In time, the hatchery was updated, fish were put back into the stream. The fishermen returned, and are again writing rapturous prose about the river on websites and in local magazines. But things have changed. Now, the fishing season never closes. Anglers still need to reserve their beats, but there is a lot less competition than there had been before. And you don’t hear as much about “sea runs” these days, although there are plenty of good-sized rainbows up in the hatchery that, when their breeding days are done, will be released into the river and, if they travel into salt water, may get their 15 minutes of “sea run” fame. But one thing remains the same as it was years ago. 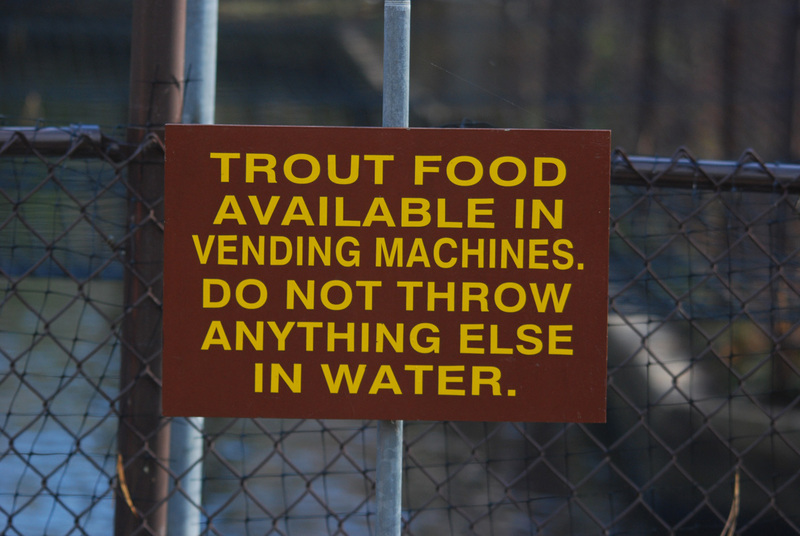 If you walk up the river to the hatchery pools, you can still find vending machines full of fish food that you can buy and feed to the trout, just like feeding goldfish, before they’re let loose in the stream. And that’s why I rarely fish in that river these days. I imagine some poor trout in the hatchery pool. One day, it’s swimming around under nets that shelter it from herons and circling ospreys, getting fat on handfuls of food pellets purchased and tossed into its tank by passing children. Then, the next day, that once-coddled fish is forced out of its safe and cozy home and into the stream, where the same sort of people who once fed it tasty pellets are now poking holes in its face and dragging it into the hostile air, the same air where the ospreys and eagles and great blue herons fly, searching for innocent, domestic trout in the river below. It’s not that I’m concerned for the rainbows themselves. They’re the epitome of what angler/author Ted Williams calls “rubber trout,” fish that are “tame, sallow, inbred imitations mass-produced in hatcheries;” they are what another author, Anders Halverson, described as “an entirely synthetic fish” that various government agencies have spread across the world, often to the great detriment of native fish populations. Their deaths would probably improve the river, if not the park’s revenues. What I’m most concerned with is the impact of such fish on myself as an angler, and on my relationship with the real and natural world. I’m a saltwater fisherman, and I’m not particularly interested in catching rubber trout or rubber anything else. Since I caught my first fish at the age of two, I’ve pursued creatures spawned in the wild, survivors that always caught their own food while avoiding becoming food for one of the myriad of predators that shared the same sea. The fish that I seek have been strengthened by current, waves and tide, and tempered by the changing seasons. They are strong, beautiful, wild animals that are worth seeking and, in this increasingly perilous world, worth conserving and protecting. But in some places, salt water fish aren’t as wild as they used to be. Some states are turning to hatcheries to artificially maintain the abundance of fish in coastal waters, rather than imposing the more restrictive management measures needed to maintain naturally-reproducing populations. It’s probably no coincidence that the Coastal Conservation Association, one of the organizations leading the fight to weaken the conservation and management provisions of the Magnuson-Stevens Fishery Conservation and Management Act (Magnuson-Stevens), is a strong supporter of saltwater fish hatcheries, or that most of the support for such hatcheries comes from the Gulf of Mexico region, where Magnuson-Stevens and its science-based management measures are generally held in disdain. As the Texas Parks and Wildlife Department notes, hatchery fish are stocked along the coast to “ensure that harvest levels are sustained.” Without the expedient of stocking, managers would have to reduce harvest levels in order to maintain the abundance of naturally-spawned fish; that would make anglers unhappy. In Mississippi, state officials have already taken the first steps toward what could be the ultimate end run around unpopular fishery rules—stocking hatchery-reared red snapper. That’s a key point, for the existence of hatcheries evidences nothing more than the failure of fisheries management. We can see evidence of that failure across the country. In Pennsylvania, native brook trout have been displaced by brown trout stocked in the state’s limestone streams. In Colorado and Wyoming, in turn, stocked brook trout threaten native cutthroat populations. After a century or more of hatchery dependence, freshwater fishery managers are beginning to rethink stocked trout’s role. Montana, despite its dependence on angling-related tourism, stopped stocking trout in its rivers and streams about forty years ago, and concentrated on conserving and rebuilding its wild fish populations. Pennsylvania still stocks, but not in its premier rivers, the “Class A Wild Trout Water” where wild fish reproduce naturally and are protected by appropriate regulation. In Quebec, scientists found that stocking lake trout in waters that hold wild fish compromises the genetic integrity of the native lake trout populations. Saltwater fishery managers don’t yet have to deal with such problems. That’s why Magnuson-Stevens is such an important law; it requires managers to conserve and rebuild wild fish stocks, and not fall back on the expedient of hatchery production. Thus, salt water anglers don’t have to encounter “rubber” red snapper or “entirely synthetic” summer flounder when they’re on the water. Strong, wild fish still fill our coastal seas. Hopefully, thanks to Magnuson-Stevens, that will always be so.